Wow! In just a little more than a week it will be Christmas. I can’t believe that; 2014 has flown by so quickly! In order to get everything to you by Christmas, Wednesday the 17th will be our last shipping day. That means that all orders for Christmas MUST be placed by MIDNIGHT on Tuesday the 16th. To be specific, that means that our 92% discount described below is about to come to an end. 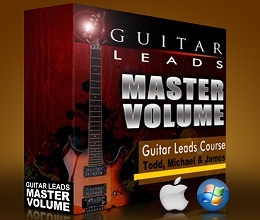 The Guitar Leads Master Volume is a massive guitar riff’s library with more than 425 riff/lead segments. In the past these were packaged in 8 separate volumes, each one selling for $29.95 for a total price of $239.60. Right now you can grab all of them, repackaged into ONE single massive guitar riffs library, at a 92% discount… or for just $19.95. That is a $220 savings. But this is no ordinary riffs package. Each riff contains interactive audio at both full and half speed. Once started the audio will play repeatedly until you stop it. And of course the 1/2 speed audio makes it easier for you to follow along and hear exactly what’s being played. But there’s more: Each riff comes with accurate tabs. As you know this is huge. The WWW is full of tabs site with mostly garbage tablature. Not the case here. We have taken the trouble to painstakingly transcribe each riff and create the tablature for it. This library installs like software on either a Mac(Osx) or a Windows machine and you access the indiviual riffs through an table of contents or index page that is displayed in your browser. This Master Volume library is normal delivered via download link…but there is no way to put a digital download in a stocking, so we have come up with a 4 color CD holder for this product, which will look great in a Christmas stocking.. (even if it is yours). p.s. Did you know we have a number of other products that are widely used by Guitarists. These also have great Christmas discounts which are about to expire. Learn2Jam – Learn2Jam is practical hands-on approach that I use every time I perform...so it’s a real world system that works… not some musical theory that sounds good but is not grounded in reality. Learn2Jam is a truly unique system that teaches you how to jam or take a solo by working with you to master 4 songs. That’s it… just 4 songs!! These four classic rock songs, once learned, will give you all of the skills, techniques and rudiments required to jam or take a solo to any song. This systems comes with 7 step-by-step DVD’s, 1 CD and jam trax booklet. Grab it at a 53% discount. Video Surgeon – is a video slow motion and zoom product. It opens video files, and changes key and tempo, allows you to zoom in, set up loop points, etc. and also download videos from YouTube. We are offering up to $50 off, plus a $1 CD if you want a physical product to put under the tree. SlideTrax – This is one of our newer products that enables a user to make a quick and simple video from any audio file in about 2 minutes. The resulting videos are compatible with and can be uploaded to YouTube and Face Book. It’s a very handy tool for musicians who have an audio file of music they’d like to share. We are offering a 50% discount. Audio Switch – AS is a very handy tool to have around for musicians. It allows for the mass conversion of audio files from one format to another. It even allows you to select video files for conversion and strips the audio from the video file. Whether you have 100 or 10,000 files, you can load them up, start the program and walk away. It’ll do all the work for you.Grab it today at a 50% discount. Song Surgeon – is an audio slow downer and you can grab it right now and save up to 55% discount on the price of the Standard model, plus the CD version is available for only a buck, in case you want a physical product to put under the tree.